I love being out and about in the cold and snowy winter months but skiing is just not my cup of tea. 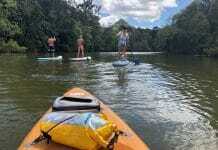 There are so many other great outdoor adventures you can have rather than spending your days on the slopes! Most Southern Californians when they think about Mammoth Lakes in February think of skiing epic terrain at 7,953 feet. 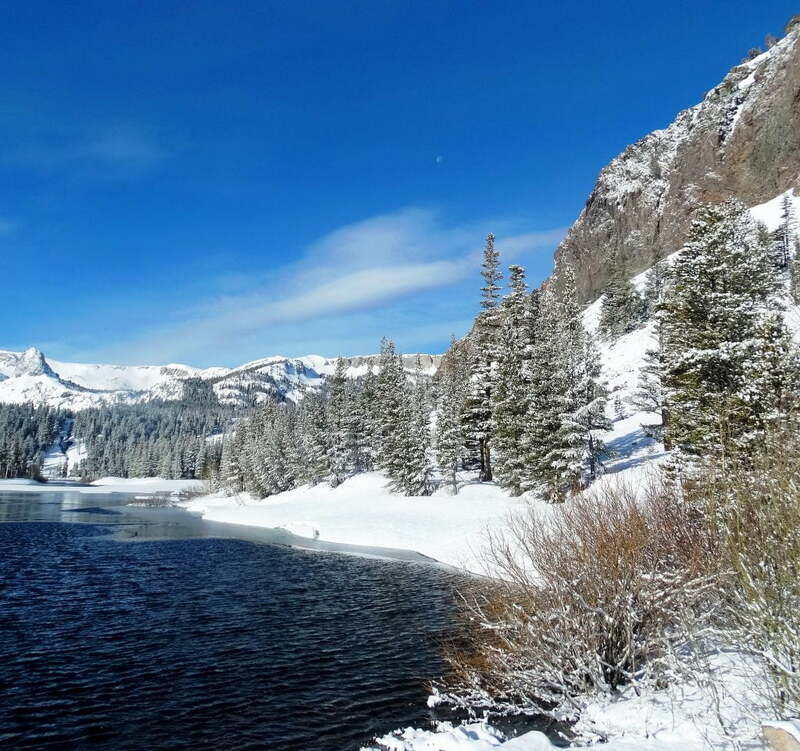 Did you know there is more to do in Mammoth Lakes in those snowy winter months beyond those snowy minarets? Read on for fun things to do at Mammoth Lakes area for non-skier types. Hey, it’s a hot spring! Four years ago I traveled to the eastern sierras in February with two friends who had both torn their ACL’s. There was no snowboarding or skiing for these two outdoor fitness nuts so instead, we focused on all the other awesome things that the Mammoth Lakes Area had to offer! Yes that means we spent a lot of time in hot springs drinking wine. 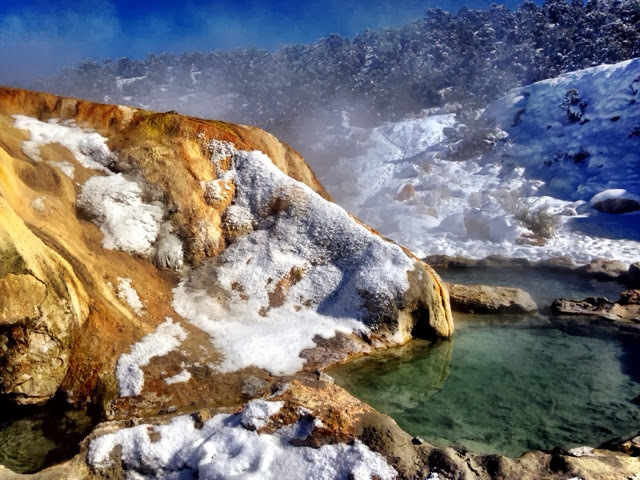 Did you know there are over one hundred hot springs in the Owen’s Valley Basin below the snowy hills of Mammoth Lakes? If you have a Jeep or any other four-wheel drive vehicle then you really need to take a trip up to Mammoth Lakes in the winter months; explore the hot springs and also check out all the other outdoor activities, a lot of which are family-friendly, that this area has to offer. Aside from hot spring exploring what other ways can you entertain yourself in snowy Mammoth Lakes? 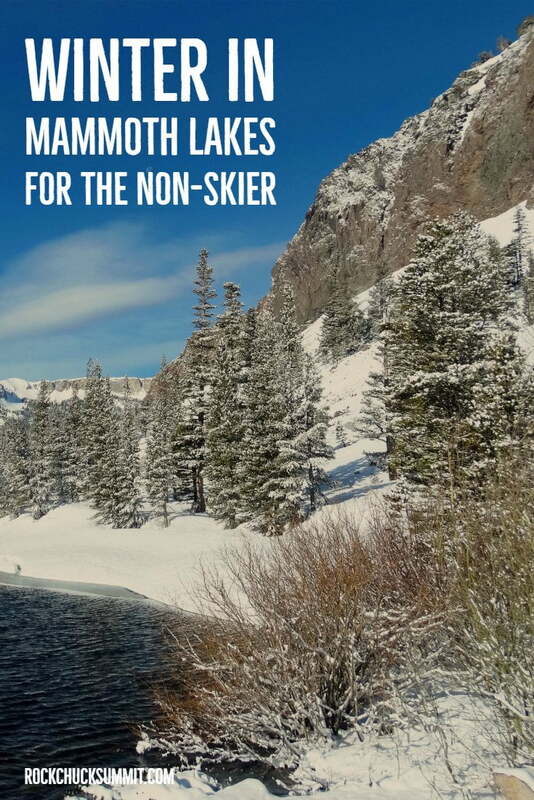 Snowmobiling, dog sledding, ice skating and snowshoeing are just a few outdoor activities available in and around the town of Mammoth for the none skier. I love ice skating in Mammoth in the winter months because they have a fantastic Al fresco ice rink! This is how an ice skating experience should be! Mammoth Lakes awesome outdoor ice rink is located right next to a gorgeous meadow giving you fantastic views of this alpine area as you skate (Or try to learn how) Their rates are very reasonable for kids and adults and they do rent skates. If you are in Mammoth for a few days they also offer classes on how to be a better ice skater. This is such a fun family-friendly way to spend a day outdoors in this charming eastern sierras ski town. Hint; take the kids to John’s Pizza Works afterwards and you have to try the pepperoni rolls! An awesome hot Italian treat for after a day of sweating in the chilly mountain air! I love spending a winters day out on snowmobiles exploring the Mammoth area. 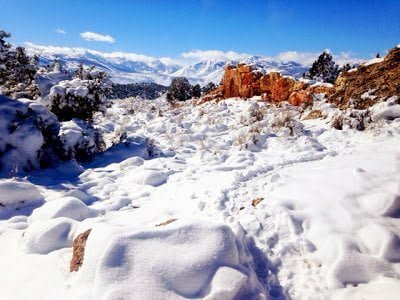 If you don’t own a snowmobile or have friends who do then no problem, there are a few outfitters in the eastern sierras who will gladly take you and your family on a guided tour through the snowy wilderness. The Mammoth area offers eighty miles of groomed trails and 75,000 acres of forest land for you to explore on back of these fast snowmobiles. This high sierras area is a fantastic place to try out snowmobiling for the first time. The Mammoth area gets over thirty feet average snowfall each winter! One thing about snowmobiling; You want to dress warm! 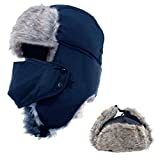 Wear layers, gloves and cover your face. No one wants frostbite on their face on those chilly days! 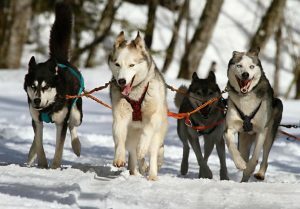 Did you know you can experience dog sledding behind a rambunctious herd of Malamutes, Siberian Huskies, and Alaskan Husky dogs without even leaving California? Dog sledding is a very fun family day out for all you canine lovers and a great way to see the snowy countryside in the eastern sierras. Mammoth Dog Teams offers all day and even overnight trips out into the forests surrounding Mammoth Lakes. This is the closest you can get to the frozen tundras of Alaska without ever leaving Southern California! If you find yourself with a day free in the eastern sierras I highly recommend renting a pair of snowshoes and exploring the snowy forest surrounding Mammoth Lakes. There are many dirt roads just outside of mammoth, especially off of the Mammoth Scenic Loop and these are excellent wide roads to go snowshoeing on. When snowshoeing in an unfamiliar area I recommend taking wide dirt roads as it’s hard to get lost on these roads. Always have your GPS or Strava turned on your phone so you can find your way back in the snow in case you get confused directional wise! These snowy mountains may be gorgeous but you do not want to get lost out here past sunset. 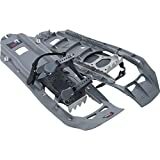 Be sure to check out our Trekking Pole Guide if you choose to hike or snowshoe! Besides having a creative name, Wild Willy’s is one of the prettiest hot springs to get to in the Mammoth area. It does involve some off-roading to get to this hot spring but you can easily get there in any passenger car. The dirt road is very well maintained and graded. This hot spring gives you just fantastic views of the snowy mountains surrounding the Owen’s Valley. Last time we enjoyed an afternoon relaxing in this hot springs we were entertained by a group of local teenagers playing a game of ice hockey on a frozen pond next to us. The Travertine Hot Springs are one of the easiest to get to in the Mammoth area because you don’t need a high clearance four-wheel drive to get to them. The drive to get to the actual pools is less than a quarter-mile off of Highway 395 down a well-graded dirt road in Bridgeport just near the Bridgeport Ranger Station. 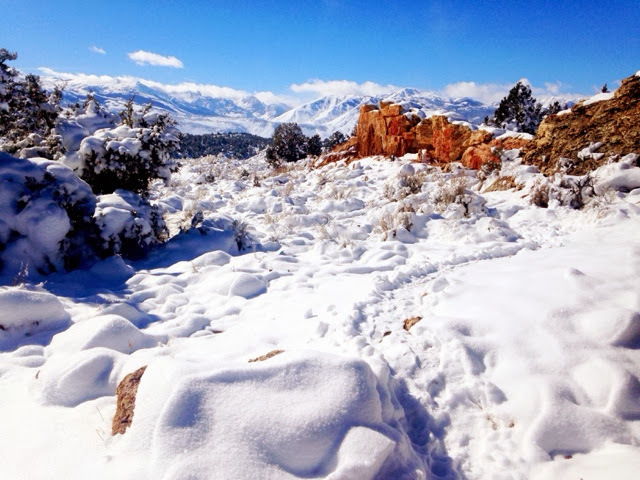 When I visited the Travertine Hot Springs for the first time it had just snowed a few inches the night before and the fresh snow next to the red stones and the aqua blue of the high sierras water was just so incredibly pretty. The hot springs at Travertine are very natural, not paved at all so don’t be surprised if you get a little muddy. One warning with visiting these hot springs; When we were there the water was incredibly hot (It felt way hotter than 103 degrees) We actually had to use the shovel we had in the Jeep to put some snow in the hot springs just to cool it down enough so we could get in. Always check the temperature of the hot springs before diving in. The hot steaming water and a combination of chilly air is one of the reasons I enjoy visiting the hot springs in the winter time. (Besides the fact the views are phenomenal with the snow-capped mountains) For more information on how to find the best hot springs in the eastern sierras check out http://monocounty.org/places-to-go/hot-springs/ where you can find great directions on how to get to the easiest to find of the hot springs. If you happen to be going as far north as Bridgeport then you need to check out Buck Eye Hot Springs. This spring is located along the creek/ river and nestled amongst pine trees. It’s an incredibly pretty area any time of year. Buck Eye hot springs is located about four miles down a dirt road near the tiny mountain town of Twin Lakes. You take a dirt road for about four miles to reach the hot springs, passing some awesome dispersed camping (that means free!) campsites on the way. You cross a pretty creek right after the camping area, drive up a hill following the well placed signs and walk down a steep trail to the hot healing waters of the high sierras. Take my advice, wear good shoes, snow boots or hiking shoes to get down this little hill. This might look like a super short walk down a steep hill but it is not fun if you do not have the correct footwear and your feet get wet and slimy in the hot spring mud. Buck Eye Hot Springs is a must do if you happen to be in the Bridgeport area! Aside from dog sleds, snowmobiles, and hot springs, there are tons more family-friendly things to do in Mammoth in the winter months. Jeeping the off-road trails and searching for bald eagles, deer, and other local wildlife is a fun way to spend a day not on the slopes. Mammoth also offers a great tube park for kids. They also have a great bowling alley not to mention fantastic breweries and great restaurants with savory winter items like elk and venison on the menu. What are you waiting for? Pack your warmest jacket and book your stay in this scenic mountain hamlet today! Pin It! Pin this on pinterest! 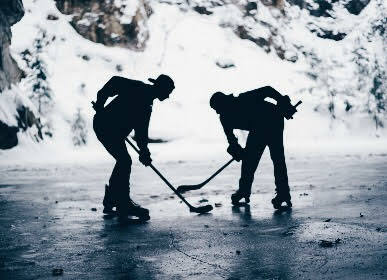 What are your favorite winter activities in Mammoth Lakes for the non-skiers? Leave your comments and suggestions below or join in our adventure community forum!